Hyper-lipolysis compound: A mix of ingredients that helps you control your weight in a number of different ways. Fat burners and thermogenics like Acetyl L-carnitine, African mango and green coffee bean sit side by side with inulin, a soluble fibre with probiotic effects for satiety and digestive health, chromium picolinate to promote efficient use of insulin, guggulesterone, which stimulates thyroid function, and CLA, which can prevent the body from storing energy as fat. Immunity booster: An energy deficit is necessary for weight loss, but it can also weaken the body's immune defences. A combination of L-glutamine and vitamin C strengthens and supports immune health. Mood Enhancer: Like your immune system, dieting can also suppress your mood. Attitude is all important when it comes to weight loss, and Oxyshred maximises chances of weight loss success with the inclusion of mood-lifting caffeine, taurine, and tyrosine. B Vitamins: B Vitamins are some of the most important in our body. Acting as cofactors for a number of metabolic reactions, B vitamins are vital for good health and energy. Oxyshred comes as a powder that mixes easily into water to produce a delicious cordial-style drink, which is available in four flavours. The manufacturer recommends two 5g scoops per 245-290mL of water, but this can be adjusted to personal taste preferences. It is a good idea to start off with one dose of Oxyshred per day and work your way up to a second if you feel this would be of further benefit. 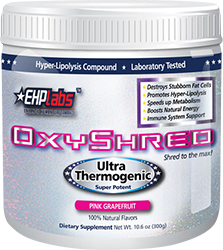 Oxyshred is best taken first thing in the morning, on an empty stomach. To maximise absorption, avoid eating or consuming a protein shake within 20 minutes of taking Oxyshred. People who take a second dose usually have this in the mid afternoon, or before a workout, leaving at least six hours between consecutive doses. Avoid Oxyshred in the evening, because it contains caffeine and has the potential to cause insomnia. Ask Us Anything - How Long Does Oxyshred Take to Work?